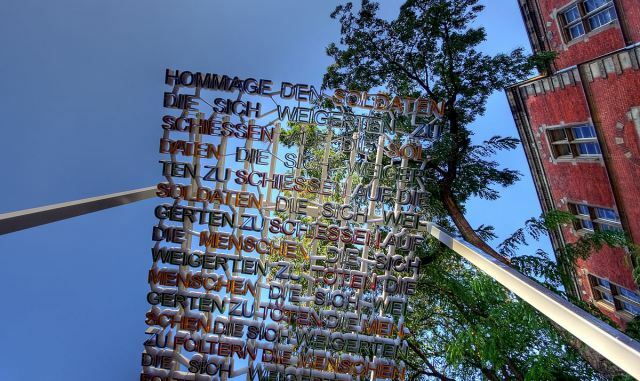 In 2009, architect Ruedi Baur constructed a memorial in Cologne for those who have refused to fight. It is a bus shelter with these words on the roof: Homage to the soldiers who refused to shoot at the soldiers, who refused to shoot at the people, who refused to torture the people, who refused to give information against the people, who refused to brutalize the people, who refused to discriminate against the people, who refused to ridicule the people, who showed civil courage while the majority kept silent and toed the line. The monument stands amidst three historically relevant buildings: the former arsenal (today a building of the Cologne city museum); the EL-DE-house, in which the Gestapo once operated its torture chamber (today the Nazi documentation center) and the former Criminal Justice building, where at least 123 people were sentenced to death during National Socialism.